Home / Archive by category "Azure Maps"
The mobility space is at the forefront of the most complex challenges faced by cities and urban areas today. The movement of people and things is as much a driver of opportunity as it is an agent of chaos, aggravating existing challenges of traffic, pollution, and unbalanced livelihoods. Today, Azure Maps is continuing to expand the offerings of our platform, introducing a new set of capabilities in the form of SDKs and cloud-based services, to enable enterprises, partners, and cities to build the solutions that will help visualize, analyze, and optimize these mobility challenges. The services we’re introducing are designed exclusively for the needs of the modern enterprise customer – powerful, real-time analytics and seamless cross-screen experiences, fortified by robust security services. Real-time location intelligence is critical for business operations. From getting real-time road data, to building asset-tracking solutions for navigating drone fleets. 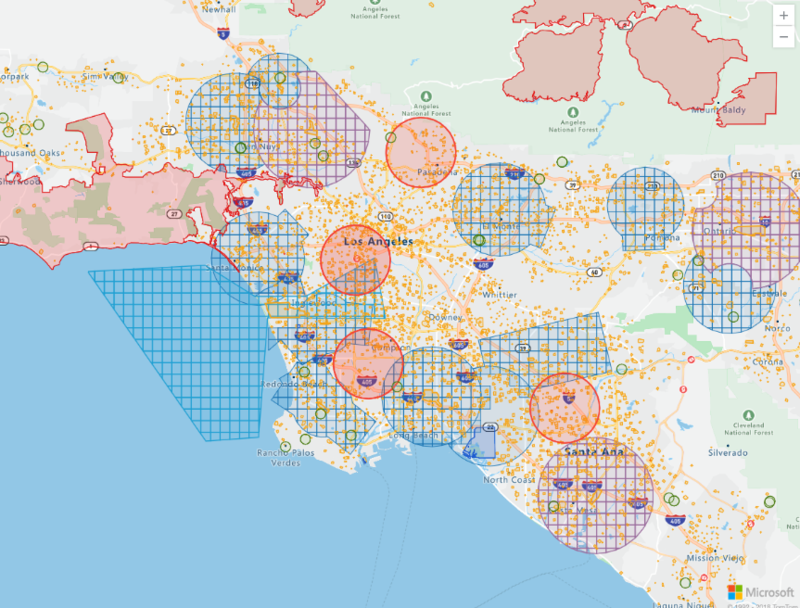 Today, we’re excited to highlight a customer, AirMap, whose software solutions rely on Azure Maps for real-time location intelligence in a new frontier of technology called dynamic mission planning for drones. AirMap is the leading global airspace management platform for drones. AirMap’s Unmanned Traffic Management (UTM) platform enables the deployment and operations of safe, efficient, and advanced drone operations for enterprises and drone solution providers. Since 2017, AirMap has been part of the Microsoft Ventures portfolio and has chosen Microsoft Azure as its trusted cloud for its cloud-based UTM platform. AirMap offers open, standardized APIs and SDKs that make it easy for software developers to integrate AirMap’s intelligence services and capabilities into third party applications. This includes situational awareness of flight conditions, airspace advisories, and global airspace regulations. The AirMap developer platform also offers easy access to AirMap’s global network of airspace authorities, who offer notification, authorization, and more to drone operators on the AirMap UTM platform. Figure 1: AirMap dynamically renders polygons representing different geographic areas subject to airspace regulations. This blog post was co-authored by Julie Seto, Senior Program Manager, Azure IoT. Over recent years, one of the most dynamic landscapes undergoing digital transformation is the modern city. Amid increasing urbanization, cities must grapple with questions around how to strengthen their local economies, manage environmental resources, mitigate pollution and create safer, more accessible societies. The modern metropolis is on a crusade towards sustainability, prosperity and inclusivity, and critical to achieving those is its digital transformation, powered by cloud, AI and IoT technologies. Through these, cities can harness the power of real-time intelligence for monitoring, anticipating and managing urban events, from traffic congestion and flooding, to utility optimization and construction.